Join us for this exciting webinar that presents the findings from an in-depth survey by Osterman Research on the current practices that large organizations use to detect and remediate bot attacks and their effects on their organizations. Don't miss this webinar. Reserve your spot now! 1) Why do attacks happen? 3) How does it impact business? 4) How can they be stopped? Educational webinar. How malicious bots, tools, infrastructure, and credentials challenge the security of the retail industry. Did you know bad bots now account for nearly 1/3 of all Internet traffic? Well yes, they do! And they pose the greatest threat to organizations that use web, mobile, and API application services to support business processes. They’re targeting your web, mobile, and API application services for their financial gain. Traditional security tools have proven to be ineffective. 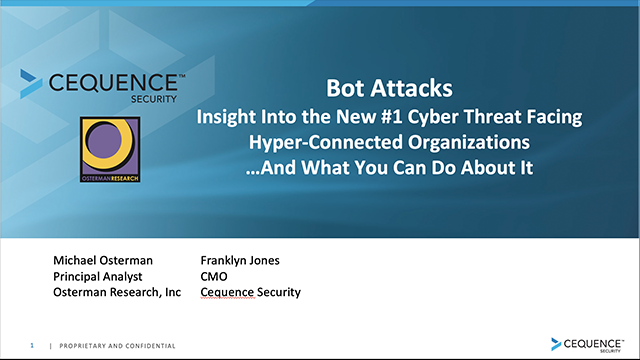 Here’s a quick introduction to the problem and the game changing bot defense platform from Cequence Security. Discover apps, detect attacks, and defend your business from bad bots.